The map features the Highway 108 corridor trailheads. Of primary importance to us is the Southbound Tahoe to Yosemite Trailhead through Kennedy Meadows Pack Station, located down an old paved road off of Highway 108. Our primary short distance destinations out of Kennedy Meadows Pack Station would be Relief Reservoir or Kennedy Lake. The upper detailed map lays out the first five-plus miles of hikes South out of Kennedy Meadows to these fine destinations. A 2.67 mile hike from the gate at Kennedy Meadows brings us to the trail East to Kennedy Lake. Another 4.39 miles hiking East brings us to the Horse Camp on the West shore of Kennedy Lake for a total of 7.06 miles. Continuing another 1.36 miles South on the Tahoe to Yosemite Trail past the Kennedy Lake trail junction brings us to the very fine campsites on the East Shore of Relief Reservoir. Another 1.34 miles past Relief Reservoir brings us a total of 5.37 miles South of the Kennedy Meadows gate to the trail junction above the Southeast shore of Relief Reservoir. Here the trail splits, with the trail Southwest leading up to Lower Relief Valley on the way over to Relief Valley. Our route following the Southbound TYT brings us to the Left, the Southeast from this junction to begin climbing more or less alongside Summit Creek up to Brown Bear Pass. Hikes to Kennedy Lake or Relief Reservoir are destinations themselves or our opening moves of greater backpacking trips. The second map on this page shows how hikes to Kennedy Lake and Relief Reservoir are gateways up to the Sierra Crest, each bringing us to a point on the Sierra Crestline further South of Highway 108. Once we get up to the Sierra Crest we have to decide where to go next. North towards Sonora Pass? Hikers into the Emigrant Basin through Brown Bear Pass can hike North over Big Sam to return to Kennedy Meadows via Kennedy Lake. We can see many fine "lollypops," trailhead to trailhead, and grand backpacking loop possibilities in the web of interconnected trails stretched across the Emigrant Wilderness. This map contains two updates to the USGS topographic backpacking map. The first is between the lower and upper footbridges just South of the Kennedy Meadow Trailhead. The trail no longer loops West through the dry canyon but is cut into the rock above the West bank of Summit Creek. I have not hiked the old route so I did some investigation. I hiked the new route carefully so I could depict it on the map above, and consulted with Marty about the route of the old trail. Marty works with Matt Bloom at Kennedy Meadows Pack Station. 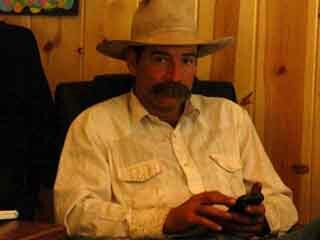 Marty is one of Matt Bloom's professional backcountry horsepackers and an all-around knowledgeable hand on High Sierra travel, trails, and terrain. Above and South of the upper footbridge the trail splits between two short route options which rejoin on the flat above the upper footbridge. This short trail split is fairly inconsequential, but from the flat where the two trails rejoin above the bridge the trail South is different from the USGS map's depiction. The trail South first encounters the Kennedy Lake trail junction, then the now-empty site where PG & E's Relief Cabin once sat. I have depicted the current route as of July 2012 as best I can on the map above. TYT Trail South from lower to upper footbridges along Summit Creek. TYT Trail route to above upper footbridge to the Kennedy Lake trail junction. From my point of view that is 1093.6 yards or .62 of a mile. That converts the diagonal distance into 4,639.8 feet or .88 of a mile. Under the Dardanelles Cone Geological feature between Highways 4 and 108 on the Western Flank of the Sierras. 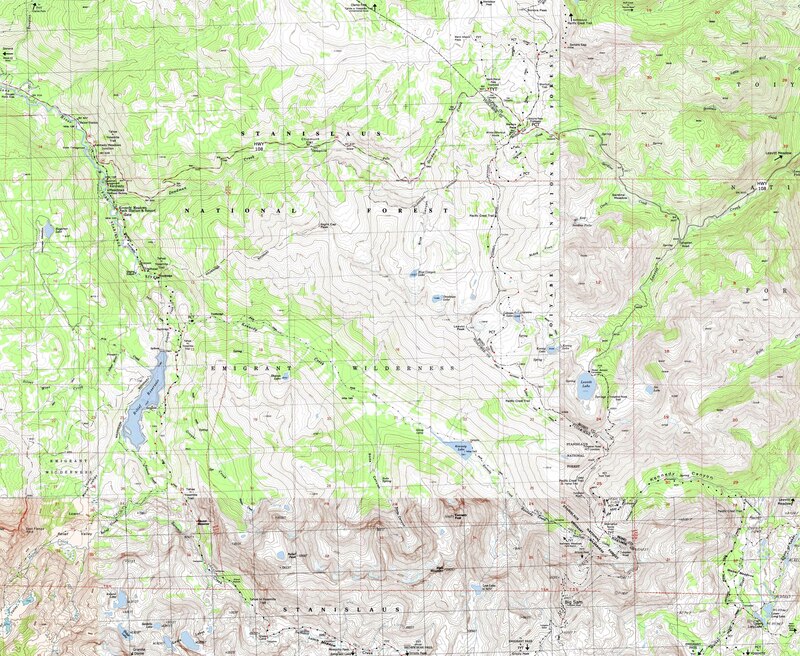 I love the USGS, as you can see from the Tahoe to Whitney Maps. I also dig the NWS, as you can see from our Weather Page. We gotta know the terrain under our feet, and the weather in the sky. These are the basics. In that spirit, let's set you up with the USGS maps sufficient to plan and execute your High Sierra Backpacking Trip with a set of custom backpacking maps. In fact, we can use the USGS to set us up to plan and hike anywhere in the US of A. Move the Map to the Sierras. Or your favorite backpacking spot in the US of A. Navigate the map to the area you wish to locate maps. Click "Mark Point" in the options to see the USGS map grid of the various scaled maps. Select the maps that will help you plan and execute your backpacking trip, set up a directory on your computer named for the trip or location of the maps, and begin downloading those suckers. Open your USGS maps with Adobe Reader. But first, we have to "unzip" the maps. Once we get the maps downloaded, unzipped, and running on Adobe Reader we can cut and paste the pieces of the maps we need together, and mark our selected hiking routes to create our own customized maps using MS Paint, Photoshop, or some other image software. If we want to print up our maps for field use we need some printer technology and knowledge. I understand Inkjet printers, special inks, and the proper paper are necessary to print up serviceable maps. At least one reader of Tahoe to Whitney has copied and printed out Tahoe to Whitney Maps with success. That is totally cool for personal and non-profit uses.